This screencast will help you get started or you can read our guide below. This quick start will walk you through creating the basic configuration; in most cases, you can just accept the defaults. When it’s done, you’ll have an index.rst, a conf.py and some other files. Add these to revision control. Your index.rst has been built into index.html in your documentation output directory (typically _build/html/index.html). Open this file in your web browser to see your docs. Edit your files and rebuild until you like what you see, then commit your changes and push to your public repository. 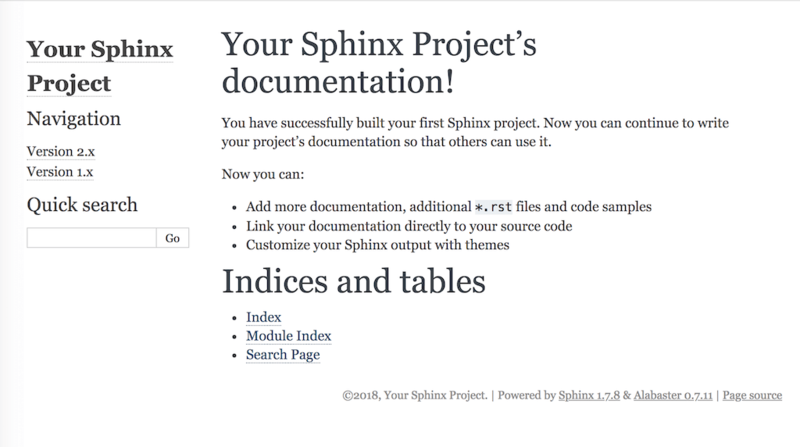 Once you have Sphinx documentation in a public repository, you can start using Read the Docs by importing your docs. Markdown doesn’t support a lot of the features of Sphinx, like inline markup and directives. However, it works for basic prose content. reStructuredText is the preferred format for technical documentation, please read this blog post for motivation. Here are some external resources to help you learn more about Sphinx.